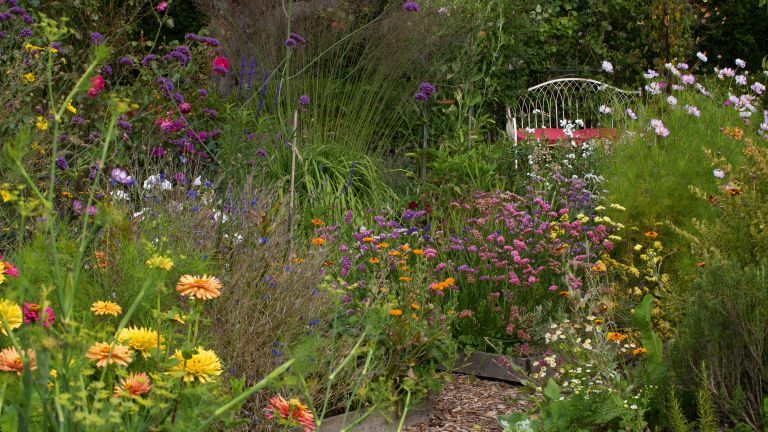 While there are no rules to say what you can and can't plant in a traditional garden, there are some plants that look so at home in a cottage garden or a country farmhouse garden. What's more, many of our favourite plants have perfectly adapted to the British climate, making them sensible options over exotic breeds that are destined to fail after a light frost. Here's what to choose for your garden redesign. Even if you live in a town or city, there is nothing to stop you creating a country feel in your outdoor space. Why not create a cottage style traditional garden in an urban setting? Meadow style planting is as popular as ever – perhaps even more so in recent years as we are rallied to make our gardens havens for wildlife once again. Cowslip, buttercups, yarrow, ox-eye daisies, grasses and other wildflowers will create a range of colours and textures. Or, if you are the practical kind, make sure you reserve at least a little section of your plot for a kitchen garden where you can grow your own and dream of a life of self sufficiency. However, when it comes to creating perfectly curated borders, hanging baskets or tubs, there are some plants that the archetypal English country garden would never be without. We asked some of the country's horticultural experts to pick some their favourite plants for traditional schemes. The Persian cyclamen is a small plant that blooms with romantic, heart shaped leaves and upswept petals in a warming range of colours from white through to soft pinks and vivid magentas. It can be planted in the garden for some autumnal colour and grown indoors as a houseplant. To grow as a houseplant, place the potted Cyclamen persicum in a cool area where it will catch the bright light but be kept out of cold draughts. It will also thrive as a planted container outdoors. When kept indoors, this pretty plant will usually bloom from November until March or April. Dead-head regularly to encourage new and continuous flower growth by tugging sharply at the dead foliage. ‘Diggory’ is one of the easiest specialist snowdrops to recognise. Rather than the petals being smooth and glossy, they are puckered and crumpled, a little like taffeta, expanding with a strong curve to resemble a Chinese-lantern, dangling from a slim stalk. The edges of the leaves curve back on themselves for a pleated effect. While taller than the common snowdrop, it is still a fairly small bulb and should be planted near the front of a border or in a raised bed where its handsome globes can be admired. Plant bulbs in late summer or buy ‘in the green’ in early spring. Snowdrops like a rich, well-drained but moisture retentive soil with good light in the growing season and summer shade and should not be allowed to dry out completely. They don’t do well in permanent containers so plant them into open soil and give them the occasional feed of general purpose fertiliser or tomato food while they are growing and a mulch of compost or leaf mould in autumn. From the middle of January, snowdrops are flowering their socks off, providing a fabulous winter spectacle which peaks in February. Always put snowdrops where you can see them from the house. They look best as part of a mixed planting scheme, so team them with mauve Crocus tommasinianus, small evergreen ferns, cyclamen and cheerful yellow aconites. They also look good with grasses or under colourful shrubs and trees such as dogwoods and witch hazel. David named this new rose for 2014 after his granddaughter, so it had to be something rather special! The soft pink, rosette blooms are of beautiful Old Rose formation and have a lovely, strong fragrance with delicious fruity tints. It is also exceptionally healthy. A vigorous, multi-purpose shrub, it is ideal for formal plantings, mixed borders or for growing in a large pot. It will also form a fragrant, floriferous hedge. Approximately 3ft high by 2½ft wide. It’s available as a bare root between November and April or in a pot all year round. Repeat flowers in fragrant flushes from late June until the first frosts. When in flower, the entire plant is cloaked in bloom right to the ground. For real wow factor, where space permits, plant in groups of three or more. The individual plants will then grow together to form one dense shrub, creating a more continuous display and making a definite statement in the border. This new single flowered dahlia was launched in celebration of Andy Murray’s Wimbledon victory. It is such a winner due to its unusual combination of large nectar-rich golden centres, warm honey and apricot blended petals, and intense bronze-black foliage. Some yellow dahlia varieties can be a little too shocking to blend into a planting scheme, but this one is a delight. A well branched, bushy dahlia that will reach approximately 80cm/1m, and with such deliciously dark foliage, it looks great near the front of a border. Alternatively plant in a handsome pot on the patio. Grow dahlias from rooted cuttings or tubers under glass in April and plant out after the last frosts in early June. From July onwards, long blooming dahlias are building themselves up to knock your floral socks off throughout summer and well into autumn. Feed often with dilute tomato feed. Never plant out without protection in place. Their juicy shoots are too tempting for every slug and snail in your garden. Place squeezed citrus rinds around the garden in early spring. These will draw out the first battalion. At planting time use copper rings or surround plants with slug deterring mulches or organic pellets. Nip shoot tips to encourage a bushy habit. Water generously. This relatively new introduction to this genus of hardy evergreen shrubs has attractive, golden foliage with slender, pointed leaves that are rich burnished gold at the tips and greenish/yellow shade towards the base, maturing to green in winter. The colour of young and old leaves varies, giving the plant an additional layer of interest. ‘Aztec Gold’ was developed by Hillier plantsman Alan Postill by crossing ‘Aztec Pearl’ for its leaf shape with ‘Sundance’ for its foliage colour. It has a Royal Horticultural Society Award of Garden Merit. It prefers a reasonably fertile, well-drained soil and is happy in sun or partial shade. Suitable for planting in the garden or in a patio pot, it reaches a height and spread of about 1.2 x 1.2m. In spring and early summer, clusters of almond-scented white flowers appear and then occasionally, if conditions suit, more will come along in the autumn. Add these to the wonderful depth of foliage colour and you have an all-round winner. If you plant in a sunny spot the end of the shoots will be a rich golden yellow and the main part of the plant will remain greener in colour. If you have a shady spot then the plants overall colour will be more lime than golden. It’s also great for attracting bees to your garden. This is a collection of four new hebes that have been specially selected for their compact habits and stunning dark foliage through the winter and spring months. The foliage has led to their being named after classic red wines: ‘Merlot Memories’, ‘Ruby Port’, ‘ Claret Crush’ and ‘Burgundy Blush’. These compact plants look great in a patio pot but will also enhance any border where they will grow to approx 60cm by 60cm. They were selected by a team of specialists at the Worcestershire nursery where they are propagated from cuttings. These hebes are best grown in sun or part shade where they will thrive. The dark foliage of the cooler months fades to a mid green just before the summer show of flowers arrives in June, making these plants with year round interest. Protect young plants from frosts and give them a light trim after flowering to help maintain their lovely habits. With four plants to choose from you can create your own wine collection in the garden! This beautiful peach coloured, fragrant rose is a tribute to Roald’s first major success as a children’s author with James and the Giant Peach. A percentage of sales from every rose sold is donated to Roald Dahl’s Marvellous Children’s Charity. A charismatic rose that will be a valuable addition to any garden, ideal for planting in the middle or back of a border or in a large pot. It matures into an attractive, rounded and bushy shrub with few thorns. It will grow to approximately 4ft high by 3ft wide. It is available to order as a bare root rose (delivered between November and April) or in a pot all year round. ‘Roald Dahl’ is a remarkably free-flowering variety. The young buds are soft orange-red, the red reminiscent of the blush found on an actual peach. The cupped rosette blooms are produced almost continuously, repeat flowering through the season. They have a lovely tea fragrance. Once planted in your garden keep your rose well watered, particularly until established. Don’t forget to dead-head the spent blooms during the summer as this will encourage even more flowers! The petals of this flower feature a mix of deep, saturated colours running into paler bands, a little reminiscent of tie-dye fabrics. Either sow in pots under cover from mid April and plant out after the May frosts, or sow directly into the ground in late April. Cover the seeds with a light layer of soil, and keep the bed moist while the seedlings establish, then thin them to about a foot apart. Rainbow will grow to 60cm and can flower from late June until the first frosts of autumn. It has strong stems and is a good cut flower for when you want something bold, fruity and with a funky, 1970s vibe! To enjoy many flushes of flowers, cut the stems above a leaf node, or deadhead them when they have ‘gone over’. A small, perennial plant. It is one of those 'excellent value for money plants'. You will never be without this plant, as it seeds itself around. Plant in sunnier, better drained spots. In a south-facing spot, it starts into full flower by late March and just keeps going right through until the frosts start. Individually the small, daisy-like flowers look like ones that you’ll find in the lawn, although white on the front and red on the reverse of the petals, but in the mass each clump produces they look absolutely spectacular. Don’t be too vigorous in removing the seedlings, as this plant will find its own best place, irrespective of where you initially put it!